Watching a tadpole complete its transformation into its final frog form can be interesting and educational. However, the type of light you expose your tadpoles to can affect how quickly they mature, as well as their physical endurance and health. Not all tadpoles make it to maturity even when no predators exist, such as in your home aquarium, but using the right light can give them an edge. Most of our home lights lean toward white or blue ranges, but a red light can make your tadpoles grow faster -- much faster, actually. If you're in a hurry to play with your new frogs, expose them to a red light as soon as they leave their egg jelly. The red light can make them mature in as fast as two weeks, while tadpoles in white light can take up to eight weeks to mature, according to the National Center for Biotechnology Information. As frog populations decrease in some areas of the world, scientists are looking into the reasons. One thing they have discovered is that an increase in ultraviolet light, specifically in the B spectrum, can slow down the tadpoles and make them more likely to be eaten by predators, according to a study published in the 2011 Proceedings of the Royal Society B, Biological Sciences. This might not be a huge issue in your home aquarium, but it's unclear whether the reduced swimming speed is combined with other health factors that could keep your tadpoles from maturing properly. Just to be safe, keep your aquarium away from direct light from your window and, of course, any UV lights you have lying around. Tadpoles tend to be more active when there's more light, which means they get exercise and enough food to grow stronger. At night, tadpoles usually take a break, just like the rest of us. In bright light, however, they are active little guys that swim around and look for food. 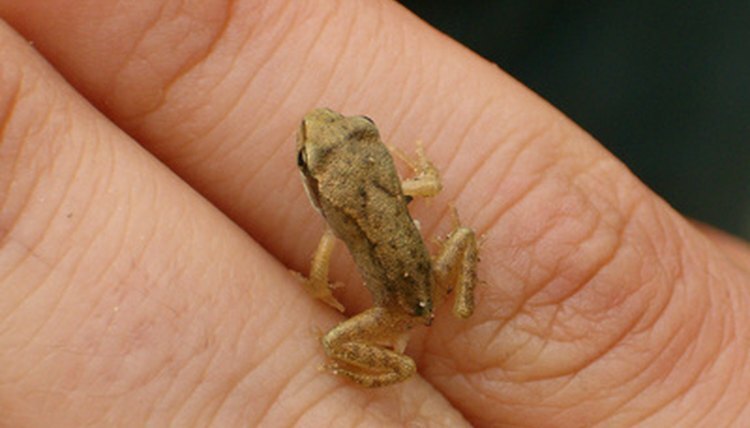 On cloudy days, tadpoles are less active, resting more and swimming slower than on bright days. To keep your tadpoles full and growing, leave a light on during the day to compensate for lack of light coming in through the windows. Light has an indirect affect on tadpoles by influencing their food and the water temperature. Tadpoles eat algae as part of their diet, and algae grows best in bright light -- that's why you won't find many tadpoles in deeply shady ponds in the wild. Tadpoles like warm water, often moving to different areas of their homes in search of the warmest spots as the day progresses. They might seek warmer, deeper zones at night, and swim into shallower waters as the bright sun heats them up later in the day. Keep this in mind for your home tadpole environment, giving your tadpoles different depths to choose from or making sure the water stays at a comfortable temperature.